Find out why SI2 diamonds can offer GREAT value. Read on to learn how to choose an SI2 diamond that appears flawless for your beautiful engagement ring. Most diamonds have flaws. You just have to get a diamond whose flaws you can’t see. Most flaws are too small to be seen with the naked eye. But when you’re talking about SI2, then it gets into more dangerous territory. SI2 is only one grade up from the Included diamonds, which we will never recommend for an engagement ring. But don’t let this scare you. 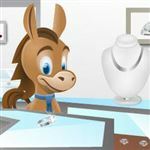 SI2 diamonds offer the most value if you make a smart purchase. You just have to be more careful in selecting the perfect diamond. In this guide, we’ll go over how to pick an SI2 diamond good enough for your engagement ring. 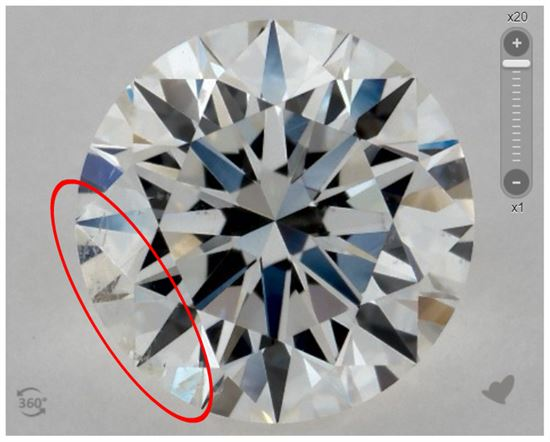 The SI (Slightly Included) grade refers to diamonds with larger flaws that can be easily seen under magnification. Depending on the flaw, it may be noticeable to the naked eye. The difference between SI1 and SI2 is that SI2’s flaws are more visible. But if you can find an eye-clean SI2 diamond, you’re going to get an amazing value. Here’s an example of an eye-clean SI2 diamond (left), VS2 diamond (middle), and VVS1 diamond (right). Who can tell the difference? But there is a huge price difference. In fact, there is a HUGE price jump in between SI1 and SI2. For example, let’s look at 1-carat round diamonds with color H and Excellent cut. For a clarity of SI2, prices start at about $4,000 on James Allen, and goes up to about $5,000 (for GIA-certified stones). Now let’s keep all other factors the same and just bump the clarity up to SI1. This increases the price to $5,000 at the lowest, and goes up to around $6,400. For reference, here’s a comparison chart that shows the price differences for SI and VS diamonds (with all other factors being the same). You can see that the SI2 to SI1 grade has the largest price jump. This is why an eye-clean SI2 diamond will offer you the best bang for your buck. Unfortunately, it becomes a lot harder to find SI2 diamonds whose flaws you can’t see. It doesn’t take an expert to see that a lot of these diamonds look quite messy. At this grade, I would say that over 60% of the diamonds are NOT eye-clean. Unfortunately, it’s pretty slim pickings. Look for inclusions along the edge. The worst locations for flaws are right under the table facet. Inclusions located more towards the edges are less noticeable and can be hidden with prongs. Inclusions in the pavilion (the bottom part) can be hidden in a bezel setting. This diamond has some cloud inclusions along the edge, which will not be very noticeable. A strategically place prong will draw less attention to them. Look for well spread-out inclusions that are less visible. White colored inclusions (such as a white crystal or white feather) are the most desirable because they blend in. Clouds that are well scattered also look less visible. The worst ones are dark crystals right under the table facet, which will look like dust specks that you just can’t rub off. The first princess cut SI2 diamond has very well spread-out cloud inclusions that you can’t see with the naked eye. But the 2nd diamond has a huge, black crystal at the center that can definitely be seen. 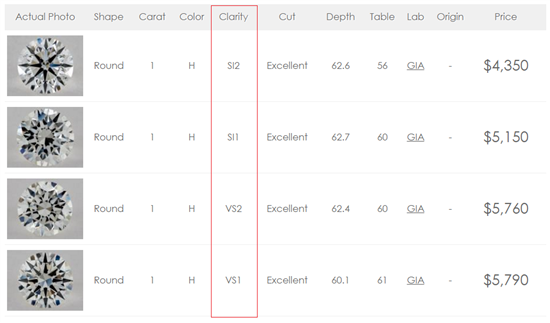 Finally, here are some last things to keep in mind when choosing an SI diamond. NEVER buy blind. This is the most important tip! Because of how wildly different SI2 diamonds can appear, you’re going to be taking a HUGE risk if you buy blind. Only purchase if you are able to see clear, magnified photos/video to verify that it is eye-clean. Tip: If you’re buying a diamond from an online retailer without photos, then we’d recommend that you stick with VS2 to be on the safe side. But we still recommend that you never buy a diamond without viewing at least magnified photos of it. 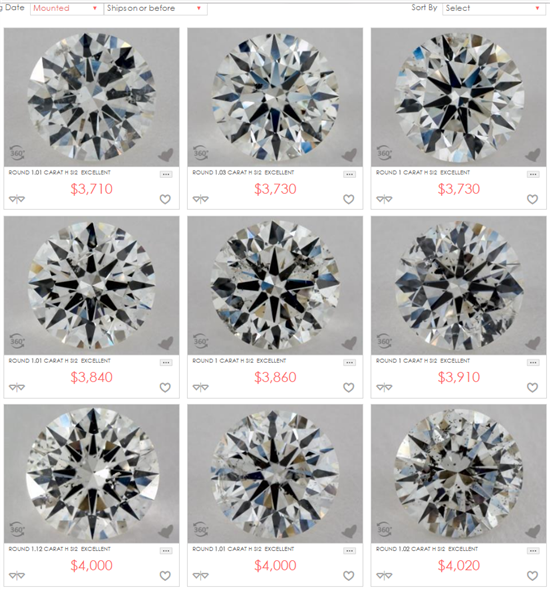 This is why our favorite online diamond retailer is James Allen; they provides HD 360-videos for every diamond in their collection, so you can spin it around see it from all angles. Look at the clarity plot. Generally, diamonds 1-carat or larger will have a clarity plot on the GIA report. This plot shows you exactly what type of inclusions were found on the diamond. It’s not a bad idea to look at it. Clarity plots can be looked at for reference, but we definitely DON’T recommend going off of it alone. Especially if you’re purchasing a diamond in the SI range. There’s just not enough information. You won’t know the true nature of the inclusion. The report doesn’t tell you its color or size or how far under the table it’s located. You don’t know if it looks as bad as it seems or if it looks worse in real life. Nothing can replace seeing the diamond with your own eyes (or a magnified picture). Only purchase a diamond that is certified with GIA or AGS! Other labs do not have the same high standards. They may grade a diamond as SI2 when it really should be graded as Included. Put the savings towards an Excellent or Ideal cut. If you want to purchase a diamond at this grade, then it’s extremely important that you get the best cut possible. An ideal cut will mask a lot of flaws and make the diamond appear more flawless face-up. Not all shapes can get away with SI2. Diamonds cut for maximum brilliance (such as round, princess, radiant) hide flaws with their intense sparkle. But step cuts (such as asscher and emerald) have a large table that peers deep into the depth of the diamond, thus easily revealing clarity. You’ll want to go no less than a VS2. We’d even recommend VS1 if you want to be extra safe. An SI2 diamond is the best value, as the price goes down significantly. You can then use the savings towards a better cut and/or larger rock instead. But you have to be really careful and work harder to find one that’s eye-clean. Just be careful when choosing one, and we recommend that you NEVER buy an SI2 diamond sight unseen. It’s just too unpredictable, even if you’re referring to the clarity plot. We highly suggest using a site like James Allen if you’re shopping for a diamond online. That way you can see if the inclusions are something you can live with.